This photograph of the front of the porch of the Subramanya Swami Temple at Sakkandurmali or Tirupparankunram, Tamilnadu, is part of a collection entitled 'Photographic Views in Madurai ' (Madras, 1858) and was taken by Linnaeus Tripe in 1858. The hill at Tirupparankunram near Madurai is the fourth pilgrimage place of Muruga. This is one of the six shrines dedicated to Subramanya and is of great antiquity as per the Tamil Brahmi inscriptions dating back to 200 BC. The present structure of the temple dates from the Pandya rulers of the 8th century and is a cave temple cut into the rock with a very tall tower or Rajagopuram and five halls or mandapas. The pillars are very elaborate and belong to the Nayaka period of Madurai. 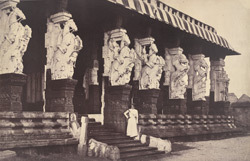 This view shows the façade of the mandapa, with pillars carved in the formed of horses and other animals.